This multiparameter meter changes everything! 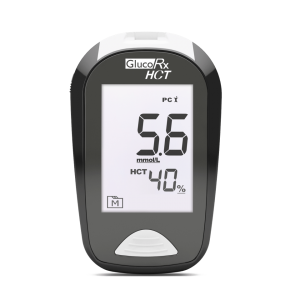 GlucoRx’s ‘HCT’ meter system specifically for insulin users is a quality, unique multiparameter machine with Haematocrit Correction Technology, that provides a complete health check by measuring blood glucose levels, ketone, and haematocrit. More than just a blood sugar monitor. GlucoRx HCT Glucose Test Strips use advanced GDH-FAD enzyme technology with 2+2 (AC and DC) Bio Signal. The AC signal works to provide the haematocrit result, and DC calculates glucose. The meter then corrects the glucose level according to the haematocrit value for enhanced accuracy in self-management of diabetes. The GlucoRx HCT meter exceeds the system accuracy requirements of latest ISO 15197:2015 guidelines. The Control solution test (QC) on this meter is auto-tagged. GlucoRx’s cost effective products help our NHS achieve significant savings. GlucoRx Meter kits and accessories provided free. Dedicated UK based Customer careline (tel 01483 755133). All meters enable software download, and will be compatible with Eclipse Telehealth/Diasend. Local GlucoRx Representatives give bespoke Training sessions; support Diabetic clinics. GlucoRx Pharmacists can manage complimentary Practice led Patient diabetic reviews. Fully funded EQA testing service. GlucoRx pledges to meet demand – products readily stocked by AAH, Alliance and Phoenix. Measures Blood glucose, Ketones & Haematocrit. Test Strips & Lancets Kit includes 10x GlucoRx HCT Glucose Test Strips and 1x GlucoRx HCT Ketone Test Strip. Also 10x GlucoRx Lancets. Reaction time 5 seconds for Glucose test, up to 10 seconds for Ketone test. Measurement range mmol/L fixed. 0.5 to 38.9 mmol/L for Glucose test, 0.1~8.0 mmol/L for Ketone test. Measuring modes Gen – any time of day, regardless of time since last meal. AC – No food intake for at least 8 hours. PC – 2 hours after a meal. Control solution test (QC) auto tagged. Accomodates AST On fingertips and palm only when Ketone testing. Software PC download facility and Diasend compatible. Other Special features Backlit screen, auto switch-off after 3 minutes without action and temperature warning. Meter Storage/Transportation conditions -20°C to 60°C (-4°F to 140°F), below 95% R.H. Strip Storage/Transportation conditions 2°C to 32°C (35.6°F to 89.6°F) for glucose test strip and 2°C to 30°C, (35.6°F to 86°F) for β-ketone test strip, below 85% R.H.